There’s nothing quite like the experience of the deep south, where friendly people, down home cooking, an experience of the old days and modern today all meet. That’s Atlanta. An exciting experience for young and old, you’ll find plenty to keep you busy and interested here. And, Atlanta is revered by many to be one of the lowest cost of living towns in the U.S. so enjoy that benefit while visiting. Although hotel rates are very reasonable all year long, the best rates can be found during the low visitor season, January through April. Magic Savings Tip: Avoid dates when major attractions are in progress, like The Masters Golf Tournament. During summer months, many attractions including museums offer free admission days. 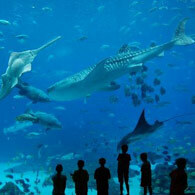 A visit to the Atlanta Zoo, with it’s over 1000 animals to view is a great day out for adults and children. This exciting zoo is one of only four that have Giant Panda’s to visit. It’s best known for the gorilla expo. For those interested in life under the sea you’re in luck with the Georgia Aquarium, the largest in the world. With over 60 exhibits, including the signature tunnel where you are surrounded by sharks, your fascination level will hit new peaks. Spend a day at Six Flags Over Georgia, and test you stomach on some of the worlds most exciting and daredevil rides. This is fun for the whole family. Another great experience is visiting Atlanta Cyclorama and Civil War Museum. Not only can you see historical artifacts from the war, but also experience the largest depiction of the war in Atlanta, on the world’s largest oil painting. If the weather is pleasant, take a stroll around the Atlanta Botanical Gardens, located on some 30 acres or more, with trails, waterfalls and lots of bright colors. Your visit to the deep south of Georgia should include at least on dinner of traditional food. An excellent example would be at PittyPat’s Porch Restaurant, named after Aunty Pitty from Gone with the Wind. Start with a traditional mint julep or moonshiners punch, and move onto gumbo, wings, ribs or shrimp and grits. Another delicious stop on the southern “soul food” train is The Busy Bee Restaurant that opened back in 1947 and is still pleasing stomachs today. Experience true southern soul food cooked the way it’s meant to be. If you’ve a whole family of hungry youngsters, you can fill up on fried chicken, club sandwiches, soups, and salads, all for very reasonable prices. For a great day trip, visit the Chateau Élan Resort Spa, Golf Course and Vineyards where you can walk the scenic grounds, play a round of golf, enjoy a massage. The separate wine tasting room offers a nice assortment of varietals and vintages to sip and purchase. Take a drive south to the town of Juliette and have lunch at the Whistle Stop Café, made famous in the movie “Fried Green Tomatoes”. If you’ve never seen this classic movie, you should rent it before you go. Hint: it’s all about the “secret sauce”. If you’re brave enough, order their fried green tomatoes, and sip a real Coke from a glass bottle. It's always great to discover a new city for yourselves - but the pressure's on when you bring the children! How to entertain them, where to go, what to do. Luckily there's plenty of information right here to help you out. We'll help you find a great place to stay so you can well and truly discover this city - and do it within your budget. If you've brought young children your first stop should be The Children's Museum of Atlanta within the Olympic park area - at 275 Centennial Olympic Park Drive. It's right in the heart of downtown so easy to get to and a remarkably well thought out Museum for children. It's interactive, there are a stack of quite eclectic exhibits and learning by fun attractions. For example, kids can learn all about color with an interaction game play that teaches them with paints how it all works. How about taking the older kids to a back stage access tour of CNN where they can see how a proper news channel puts its programming together. You'll see the behind the scenes action and watch as a news broadcast is put to air. The most exciting thing? How the weather screen works. If you're staying close to the midtown area, take the kids to Center for Puppetry Arts where you can catch a show and even watch as artists make their puppets and construct the sets. Hopefully you'll catch the Lion King puppet exhibit and the Pigs in Space display. Who doesn't love a great bar, set down a little back alley, up a narrow flight of stairs and something clearly only the locals only know? There are plenty of those in Atlanta and plenty of great, popular bars too. Here are a few favorites. The best part about Atlanta is how relatively close everything is. You can enjoy midtown and Buckshead all in the same day. Find cheap accommodation in Atlanta and enjoy a long weekend in style. The midtown area is home to a variety of bars and clubs to suit whatever kind of night you have your heart set on. Bring cash for parking, park the car once and do all your trawling on foot - it's easy, safe and good for your health! The bars we'll reference here are in the area of Crescent Avenue and Piedmont Avenue between 11th Street and 14th Street. 1150 Peachtree St. (entrance off Crescent Ave)is home to Opera, one of Atlanta's big clubs. This is where you either start your night or end it. The dance floor is big and busy (you'll need some serious moves here) and the vibe is a sophisticated, international DJ one. Happily there's a little outdoor Zen garden to cool off in for a while. If you're after a quieter night with more of a down home feel, then the Steamhouse Lounge at 1051 W Peachtree St. NW, is the answer to your prayers. It is a hole-in-the-wall oyster bar and late night lounge serving up hot, fresh seafood until midnight and cold beers until 2:30 a.m. every day except Sundays. Great staff, casual atmosphere and a real treat. Sutra is at 1136 Crescent Ave is a top-notch club with all sorts of awards for the decor and vibe it gives off. It's a small, more intimate club with a decor that will blow you away. You can have a great night supping on cocktails and making for the dance floor when the need strikes. The downtown revitalization of Atlanta continues apace - with the enhancements first promulgated before the 1996 Olympic Games kicking off an urban renewal the envy of the world. 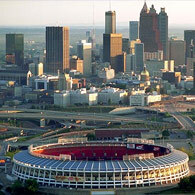 Atlanta is a truly enjoyable city to explore, so check Cheaprooms.com for quality hotels to choose from in Atlanta. If you want to experience the best Atlanta has to offer, the downtown area hotels offer great value for money and are an ideal base to explore the city from. Perhaps your first stop is the almost brand-new Georgia Aquarium - built in 2005 and now regarded as the largest aquarium in the world with a tank capacity of more than million gallons. 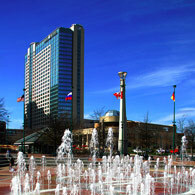 Stay close with a good deal on Cheap Rooms and show the children one of Atlanta's top attractions. One of Atlanta's - and the world's - largest companies is the Coca Cola Corporation and their World of Coca Cola building is a huge exhibition attraction detailing the history, the artifacts from over a hundred years in business and some entertaining interactive exhibits. It's pop culture for sure, but the 4D theater is enthralling and the working bottling line a fascinating example of complex logistics made simple. Atlanta's history is writ large in the story of Martin Luther King Jr and the National Historic Site draws visitors from around the world. The living memorial preserves the places where he was born, built his legacy and was finally laid to rest. The Olympic games did so much for Atlanta and the re-designed, revitalized downtown area is an oasis and example of urban renewal. The Park features the Olympic symbol and a marvellous interactive fountain. For something completely different why not check out the Woodruff Arts Center - this is the home and heart of Atlanta's burgeoning cultural life and encompasses the High Museum of Art as well as other cultural institutions. Some of the most beautiful moments on earth, captured on film. A Romantic weekend in Atlanta? Yes please! You may not have ever thought of Atlanta as the city of lurve... but we beg to differ. Put on your romance badge, pack the bags and make your way to midtown Atlanta for a citified, sophisticated weekend away. Check Cheaprooms.com for quality hotels to choose from in Atlanta. You'll find off season Atlanta hotel rooms are great value and many offer luxury addons to entice the romantic getaway crowd. 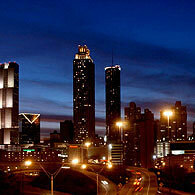 Atlanta can be laid back, a shoppers paradise or an ideal place to recharge the romantic batteries. Choose a good deal on Cheap Rooms that best suits what you want to do with a short break away from home and the rest is up to you. If part of your romantic recipe is dinner and a good show, then midtown is definitely the answer. Start with dinner at Canoe (ask your concierge for details), then head out to the Actor's Express Theater for a more cutting-edge kind of show that will invariably showcase a standout performance. For a little shopping R & R the next day head to Atlantic Station - a mini city within a city that highlights local designer talent in the range of boutiques. There's an avant garde feel to the hip sidewalk cafes and cool restaurants. There are free shuttles to and from the Arts Center MARTA station. A little music to get you in the romantic mood? Try the Woodruff Art Center and if you're lucky the Grammy Award winning Atlanta Symphony orchestra may be playing. If you're even luckier, a moonlit performance at Chastain Park Amphitheater will make a for a great date night performance. Gone With The Wind fans can tour the house where Margaret Mitchell wrote the classic - the three story Tudor revival mansion is in the heart of midtown and there are daily tours, plus a museum shop. Shop 'til you drop - in Atlanta! There's a lot to be said about coming to Atlanta at this time of year - warmer weather than elsewhere and, even if the weather does turn in, great shopping! Check Cheaprooms.com for the range of hotels to choose from and get the girls organized because the discount rooms in Atlanta are at some of the best hotels in the city. Think day spas, glamorous wine bars and in-room luxuries! If you're here for the shopping and day spa retreats, you'll need more than a day or two so get a good deal on Cheap Rooms and get ready to enjoy a little bit of southern hospitality!. If you like a little bohemia in your shopping mix then the Little Five Points shopping area in Atlanta is a good first stop. Here's where you'll find an eclectic mix of great art galleries and quirky little boutiques. There are theaters and venues and an excellent array of independent shops crammed with stuff you won't find back home. It's Atlanta's answer to Haight-Ashbury and brings a sense of bohemian sub culture to Atlanta. You'll find great food options here - including all the healthy, organic fare you could shake a stick at and a range of good coffee shops that go way beyond the familiar brand name in terms of quality. If you're after high-end luxury, uncompromising glamor and a bit of ooh ahh, then head for the Buckhead shopping district in the northern zone of the city. It's the business and financial district - and the big brand-name luxury shops. Seen and be seen! The shopping centers around the intersections of Lenox, Peachtree and Piedmont Roads and here's where you'll find more than 1,400 shops, clubs, restaurants and cafes! Pack that plastic, and get going. Atlanta boasts so much to see and do it's hard to know where to start... So let's start at the top - but before we do, check Cheaprooms.com now to find the best hotels and discount rooms in Atlanta so you can get out there and spend, spend, spend! The first must see is a local attraction that only opened in 2005. The Georgia Aquarium is the largest in the world and it has become a huge drawcard for Atlanta. The good deals on Cheap Rooms will get you here, so get clicking. The Georgia Aquarium is on Baker St and is open 365 days a year with impressive exhibits and marvellous interactive shows. There are thousands of fish and sea creatures including whales, sharks and piranhas... so bring your swimming gear (just kidding). Right next to the Aquarium is the World of Coca-Cola tour. It's an interactive look at the company, its products and its history with a 4D theater to show you how the whole process works. Have you ever wondered how a cable TV news show really works? The behind-the-scenes tour at Atlanta's CNN takes you into the busy studios and gives you a whole new look at the news. It costs just $15 and you'll see the action live as it's happening. While you're here you have to check out the world class Atlanta Zoo and one of the best downtown city parks in the world - the Centennial Olympic Park.